‘Cause everybody knows, when you hit the bottom you go, to the abyss all on your own. Well I hope you take it slow. 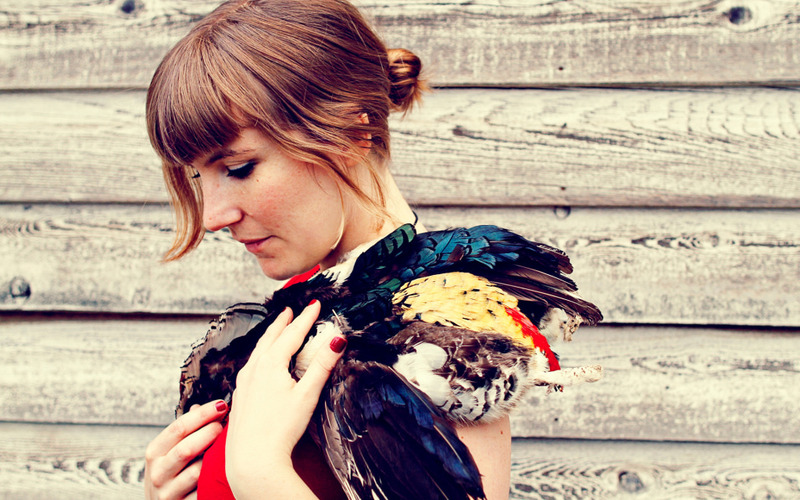 Emily Jane White’s melancholic take on folk rock has raised comparisons to other contemporary female singer-songwriters like Cat Power, Kate Bush, and PJ Harvey. Raised in the seaside town of Fort Bragg, California, it wasn’t until college that Emily began creating her musical style, fronting her own band Diamond Star Halos. After spending some time in France upon graduating college, Emily returned to California in 2006 and based herself out of San Francisco. She released her debut album, Dark Undercoat, in 2007 via Oakland, CA-based label Double Negative Records. Her sophomore effort, Victorian America, was released first on French label Talitres in 2009, then the US in 2010 on Milan Records. In recent years, Emily has regularly toured France, Switzerland, and the Netherlands, among other European countries, due to her devoted European following. Emily’s third album, Ode to Sentence, was released on June 12, 2012. To be unfairly reductive, Emily Jane White's beautifully intense new album Ode to Sentience is one part Neil Young, one part Cat Power, and one part Flannery O'Connor. The Bay area folk artist weaves her dry yet highly potent vocals and finger-picked guitar work into dark, roots-y compositions. She creates a world where things don't seem quite right, but the landscape is so intriguing you can't help wanting to explore. A native of Fort Bragg, CA, a sleepy city nestled along the Pacific coast in remote Mendocino County, Ode to Sentience is the artist's third album, and arguably her best. While the tone of big open spaces and sedate beauty are consistent throughout the record, White plays with various elements of traditional American music. Standout “The Cliff” sounds quite a lot like fellow Northern California resident Neil Young, around his After The Gold Rush/Harvest era with its gentle percussive swagger and grand pedal steel. She sings plainly and filled with pathos, her voice sometimes rising, and sometimes dropping off to a whisper. It's hard not to hang onto every line when she sings such poignant resignation “‘Cause everybody knows, When you hit the bottom you go, To the abyss all on your own, Well I hope you take it slow.” On tracks like the excellent “Oh Katherine,” White conjures mystical folk ballads that seem wholly separate from 2012. It's made up of just nimbly picked guitar, deep cello, and White's vocal performance, which easily takes center stage. Singing lines like “Oh Katherine, where is my kin?/For the grim reaper has come and tucked me in” the lyrics feel purposely dark and archaic, though her melodies are airy and pretty as ultimately White doesn't remain morbid. “The Law” follows in the same minimal folk format, but adds the shadowy rumbles of piano and the vocal intensity that helps White get compared to Cat Power so often. Ode to Sentience is a reflective and melancholy album, but pulses with a sense of determination and fiery emotional power beneath the darkness. At the end of the day, White proves herself to be an exceptional songwriter, one who's album to turn simple reserved parts, into a powerful whole.